This is the training/spotting cartridge used with the 83 mm SMAW rocket launcher deployed by the U. S. Marine Corps beginning in 1984. The rocket launcher is based on the Israeli B-300 system. A British designed 9mm spotting rifle is mounted on the right side of the launcher. The rocket launcher is reusable and each rocket comes in a disposable sealed tube which is affixed to the launcher. There are different 83mm high explosive rockets which include anti-armor (HEAA) and a dual purpose anti-fortification (HEDP) rounds. The 9mm rifle is used for for spotting to increase the first round hit probability with the rocket round, and for use in training. The British origin of the spotting rifle accounts for the British headstamp (RG for Radway Green) on the round shown below. The round illustrated is only a tracer loading. A spotter-tracer loading is also made. The round consists of a necked-up 7.62 x 51 case fitted with a lead projectile, gilding metal cap and a trace cannister at the rear. The parent case has been modified to accept a .22 Hornet case which holds the powder charge and is crimped and sealed.. The only headstamp which is legible is the one on the .22 Hornet case which is: RG 83. "The Shoulder-fired Multipurpose Assault Weapon (SMAW) system was managed by the Navy lab at Dahlgren, VA (NSWC Dahlgren Div) for the Marine Corps at Quantico, VA. The cartridge was therefore assigned nomenclature in accordance with Navy practices and bears the official designation of Mark 217 Mod 0. 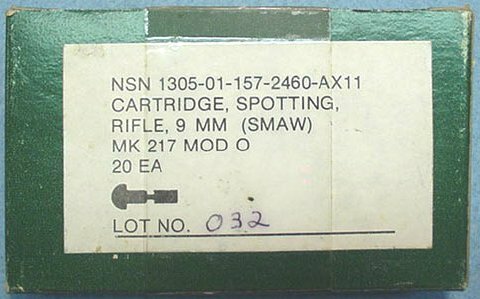 Quite interesting about this cartridge is the fact that the 9mm spotting rifle operates semi automatically by means of primer actuation. In this concept the primer sets back rearward upon firing to unlock the breech bolt. Fired 9mm spotting cases look rather peculiar because the 22 Hornet case backs out about 1/4 inch. This idea of primer actuation was conceived by John Garand (who was a notable Canadian by birth). Garand experimented with several prototype semi automatic rifles using primer actuation in the early 1920s while at Springfield Armory. Some specially primed cartridges were loaded by Frankford Arsenal for Garand's experiments but he abandoned the idea in 1926 when he learned that the Ordnance Corps had decided to secure primers in the case as a general practice by means of mechanical crimping, such primer crimping being required by machine guns. Engineering for the SMAW and its 9mm spotting rifle was performed by Royal Ordnance people in UK. They deserve a word of recognition for having successfully fielded a primer actuated small arms weapon in US military service. John Garand would be proud to know that his idea had sufficient merit to eventually be fielded. Here are photos of the MK 217 cartridge carton and a photo of the fired case showing the primer set back about 1/4 inch, enough to unlock the spotting rifle's breech."